A journalist takes a photo of Pope Francis during a press conference aboard a plane on his way to Panama. Pope Francis says the internet needs to rediscover its potential for building communities and sharing knowledge instead of discrediting people, venting prejudices and distorting relationships. In a message to mark the Church's world communications day, the Pope welcomes possibilities the web and social networks open up but also warns of the dangers. “If the internet represents an extraordinary possibility of access to knowledge, it is also true that it has proven to be one of the areas most exposed to disinformation and to the conscious and targeted distortion of facts and interpersonal relationships, which are often used to discredit,” he writes. His message comes a few days after the Covington Catholic high school controversy which erupted across social media after a group of schoolboys wearing pro-President Trump hats saying “Make America Great Again” were filmed apparently taunting a Native American veteran, Nathan Phillips. While there was a rush to criticise the schoolboys on Twitter, later video emerged which released the boys from these charges, although without completely exonerating them or their school leadership. The episode has been held up as a low point for social media and a lesson in not rushing to judgement. Francis’ message represents his increasing focus on the opportunities and dangers of the digital world and comes a year after he used another world communications day message to describe fake news as the work of the devil. 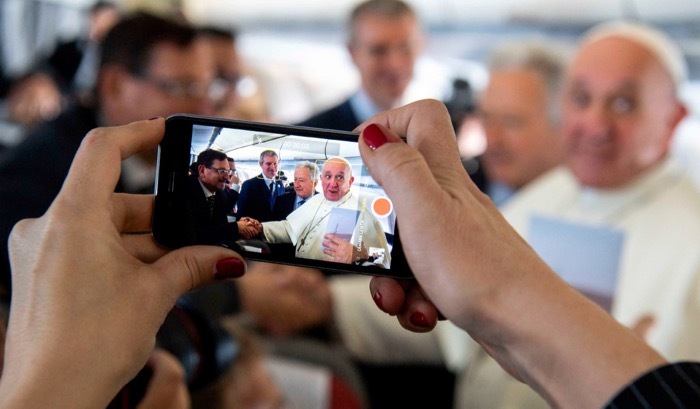 While Francis is the first Pope to pose for selfies and has maintained active Twitter and Instagram accounts, he has also argued that young people are lost in a “virtual world” rather than reality. “We have to help young people ‘land’ in the real world,” he told a gathering of priests in Rome last year. Fortuitously, his communications day message was released after his arrival in Panama for World Youth Day. Francis is now arguing that the internet must go back to basics. “It may be useful to reflect again on the metaphor of the net, which was the basis of the Internet to begin with, to rediscover its positive potential,” he writes. “From an anthropological point of view, the metaphor of the net recalls another meaningful image: the community. A community is that much stronger if it is cohesive and supportive, if it is animated by feelings of trust, and pursues common objectives. The community as a network of solidarity requires mutual listening and dialogue, based on the responsible use of language. Social network communities are not, Francis points out, “automatically synonymous” with community and there is a risk that young people can end up as “social hermits" alienated from society. He also warns against social media being used to define oneself in “opposition” to other people and used to vent prejudices: including ethnic, sexual, religious and others. While the Pope has criticised fake news and the damaging effects of information distortion of the net, he has repeatedly praised the work of journalism. He thanked a group of journalists during a gathering at the Vatican in November for being able to “call injustice what is injustice” and a month later paid a visit to the offices of Rome’s newspaper, Il Messaggero, to mark their 140th anniversary. On his plane trip to Panama, Francis was visibly moved as he paid tribute to Alexei Bukalov, the late Rome Correspondent for the Russian news agency Tass. The World Day of Social Communications is due to be marked by most local churches on the 2 June, the Feast of the Ascension. Francis message to mark the day was released on 24 January, the Feast of St Francis de Sales, the patron saint of journalists.